On 20 March, the Leibniz Research Alliance Science 2.0 sent out invitations to its third BarCamp, traditionally conducted as a pre-event one day before the corresponding international conference. Open science is currently picking up speed throughout the world, a trend that is manifesting in, among other ways, European research policy. 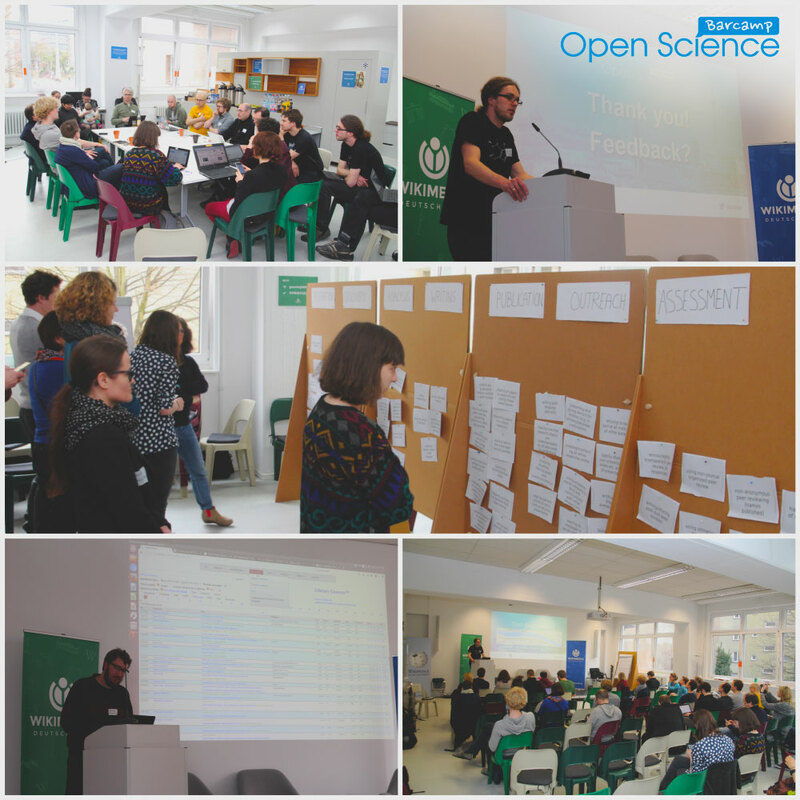 To tackle the question of the open science movement, the meeting took place this year for the first time under the banner of the “Open Science Conference”. The BarCamp followed this development with the “BarCamp Open Science” label. The venue for both events this year was Berlin. This year Wikimedia kindly made its premises available for the BarCamp. After three BarCamps, we can see a recurring pattern: every year, the contributors (at BarCamps we don’t talk in terms of, for instance, participants) are a mixed bag and come from very different backgrounds, although the dominant demographic tends to be younger people. Every year, too, about half of the contributors who come are attending a BarCamp for the first time. What stood out this year was that the BarCamp and the conference were sold out several weeks in advance. A fantastic success that we didn’t anticipate. The proportion of international contributors also increased considerably this year, meaning that the use of English as the language for the BarCamp was this time a done deal. This development shows that open science has arrived as a broad-based movement – or is at least arousing a lot of curiosity. 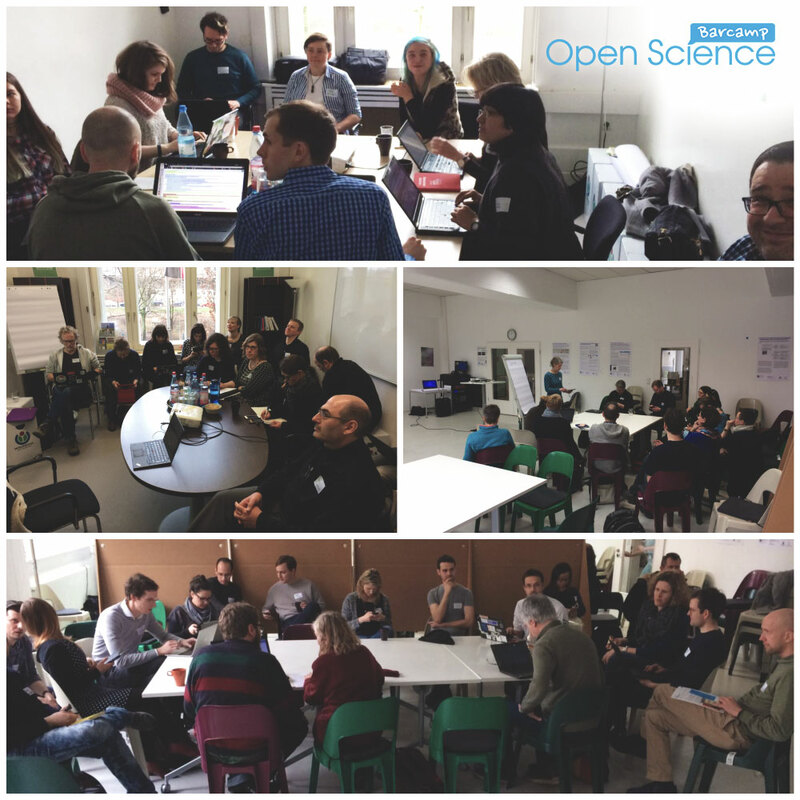 The Open Science BarCamp depends above all on people who are looking to get into dialogue about open science practices – true to the motto of the BarCamp, which is “Putting Open Science into practice”. As always, both experienced and active open science practitioners were in attendance, as well as people for whom the whole topic is still relatively new. 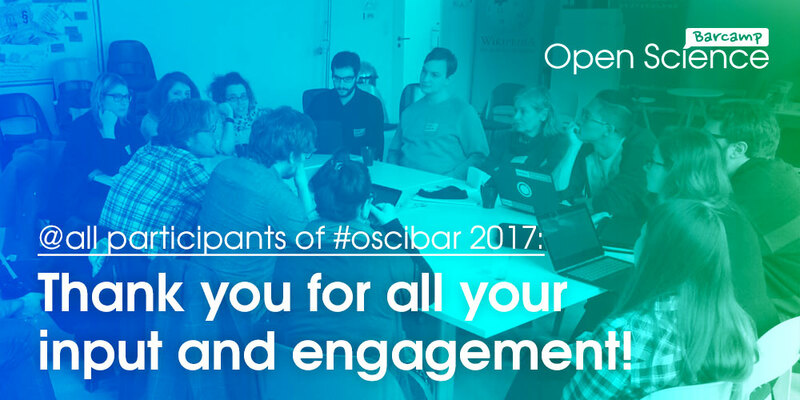 At this year’s BarCamp, as was the case at the conference, particular attention was paid to open educational resources (OER). To date, the two communities have had little do with one another, but cooperation between them appears to make sense. OER can be used, for example, to communicate open science practices in teaching situations. What’s more, key aspects of OER, such as a willingness to collaborate and share, are also to be found in open science. It was for this reason that this year’s “ignition talk”, given by Annekatrin Bock from the Georg Eckert Institute for International Textbook Research” (GEI), dealt with the interface between OER and open science. In her presentation, Bock stressed that the acceptance of open science practices, whether they concern open science in the classical sense or OER, is beset with fundamental cultural and social issues: Why is it helpful to share your data (or, for that matter, teaching materials) with others? The active application of open science and OER is thus in the first instance a matter of attitude, a personal preference on the part of researchers. This year, we had room for 20 sessions, all of which we filled with ease. It was no doubt helpful that many of the participants used a special pad for session proposals, meaning that some sessions had already been prepared in advance and communicated via the pad. As always, there were some perennial issues, such as open research data, replicability, metrics, incentives and the communication of open science practices. However, specific projects and project results were also presented, for instance the latest re-launch of the “Open Knowledge Maps” project and the results of a study on altmetrics from the EU “OpenUp” project. Also of interest was the presentation of “LibGen”, the technology behind “SciHub”. Distribution of session planning: half at the start, the other half after lunch. It could be that people who were on the shy side might come up with their own ideas in the previous sessions and would then also be confident enough to propose them as a session. The organising team should be balanced and diverse at all levels (moderators, photographers, etc.). The option to propose sessions in a more anonymous and freer manner. One session, particularly stood out this year. In this session, a workshop was conducted with a clear objective, a clear structure and appropriate preparation. It was organised by Bianca Kramer and Jeroen Bosman on the subject of open science practices along the scientific workflow. To illustrate this, a workflow consisting of seven phases (preparation, discovery, analysis, writing, publication, outreach, assessment) was outlined with which open science practices, typically prepared in advance, were matched. In step 1, the contributors were permitted to extend the range of open science practices. In step 2, the idea was to select the practices that would be easy to implement and have a big effect. Step 3 envisaged the formation of small groups, whose task was to seek out the most important two practices from the selected practices for a particular phase and to discuss why these might work particularly well across the board, irrespective of the discipline in question, and where there might be obstacles specific to particular disciplines. The results were documented on metaplan walls and then presented in the plenary session. Generally, the extensive use of facilitation material was strikingly high this year; sometimes, however, with the consequence that sometimes less was written on the session pads. One session, was spontaneously proposed with the objective of just talking about OER and open science. A further session, was devoted to MOOCs, although it became clear that the featured MOOCs were not OER. Generally speaking, the five Rs (Retain, Reuse, Revise, Remix, Redistribute) represent a recognised definition of the central characteristics of OER, which is also in keeping with the spirit of open science. In many sessions it was also stressed that open science practices need to be taught. A transfer must take place to help dismantle culturally and socially determined barriers. OER could also be used for this purpose. So there is still a lot of potential in the cooperation between the OER and open science communities. One finding reinforced our existing view: Students often have no practical relationship with the typical “open” questions, such as how you publish and where you go with your research data. Nevertheless, it is in many respects worthwhile addressing the issue of openness with students too. Given the right guidance, for example, experience in editing Wikipedia can be gathered. Institutes like the Wiki Education Foundation, can help here. As is usually the case with a BarCamp, there is a meta-pad, with all the essential information. Here you’ll find, for instance, an overview of all the blog posts related to the BarCamp and a list of all the contributors, which has been put together on a voluntary basis. What’s more, there are links to all the session pads. In addition, as in the previous year, Open Science Radio, covered the BarCamp, interviewing almost all the session moderators about their respective sessions and promptly releasing audio podcasts. The Open Science Conference will take place again in Berlin in 2018, and with it the Open Science BarCamp. We look forward to seeing you again!